As we get ever closer to the end of mainstream support for both SQL Server 2008 and SQL Server 2008 R2 on July 8, 2014, I am very curious whether Microsoft is planning on releasing a SQL Server 2008 R2 Service Pack 3 or a SQL Server 2008 Service Pack 4 ? SQL Server 2008 Service Pack 3 was released on October 25, 2011 , and we are now up to SQL Server 2008 SP3 CU15. 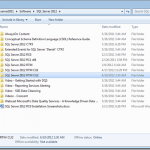 SQL Server 2008 R2 Service Pack 2 was released on July 26, 2012, and we are now up to SQL Server 2008 R2 SP2 CU10. I am not looking for release dates, just some word on whether there will be new Service Packs for SQL Server 2008 or SQL Server 2008 R2 before they both fall out of mainstream support this July. Since many organizations still refuse to install Cumulative Updates, we have the very strong possibility of many customers running some very old builds of SQL Server 2008 and 2008 R2 going forward unless we get a final set of Service Packs for both versions. As Paul Randal discovered in his recent survey, a very large percentage of SQL Server 2008 and 2008 R2 instances in the wild are already running on “unsupported service packs”, and this situation only got worse when SQL Server 2008 R2 SP1 fell out of support on October 8, 2013. These links show the builds that have been released since the most recent Service Packs for SQL Server 2008 and SQL Server 2008 R2. If you want to try to influence Microsoft in some small way, please take a moment to up vote these Connect items. It only will take a few seconds to click the green arrow! If you have a bit more time, write a comment in any of the Connect items. It would be equally cool if they provided slipstreamed versions after each Service Pack – wishful thinking I suppose. I agree they need to get SP3 out for R2 – it’s long overdue. Glenn, what is meant by ‘mainstream support’? Will MS still help if I have problems with my SQL Servers? After mainstream support ends, there will be no more Service Packs or Cumulative Updates. Microsoft will still release security updates if any are necessary. You can still get support from Microsoft after mainstream support ends, but if your problem is caused by a code defect in SQL Server, Microsoft will not fix it, unless it is security related or you have paid them for extended support. I don’t think they have made a final decision about SQL Server 2008 SP4. Hopefully, they will give in to popular opinion and release it. Any feedback they get about this is helpful. Thanks! My current client is performing a migration/upgrade next month…to SQL 2008 R2! M$ best release those service packs!